A graduate of the Logan College of Chiropractic and an athlete, Dr. Andy has been interested in health and wellbeing for as long as he can remember. 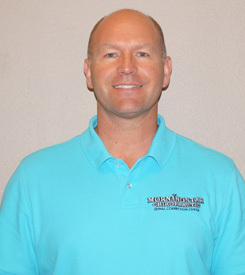 Driven by a passion to help people realize their optimal health potential, it comes as no surprise that Dr. Andy chose chiropractic care as his career of choice. There is nothing more satisfying than seeing a patient get that light-bulb “Aha” moment, when they realize the transformative power that corrective chiropractic care can offer. Dr. Andy is not just about facilitating adjustments in patients. He champions a broad-based approach to patient care, which incorporates the whole person, not just the problem. From nutritional and dietary support, to advice on how to eliminate environmental toxins, Dr. Andy provides each of his patients with a comprehensive, all natural care-plan. As an athlete himself, Dr. Andy aims to help his patients realize the amazing health benefits that can be reaped from a simple and achievable approach to exercise. A father to three daughters, Dr. Andy is a committed family man. They are a very active family and when not spending quality time with his wife and girls, Dr. Andy enjoys boating, fishing and golfing. The Morningstars are a very community-orientated family, and take huge pride in their active involvement with the local church. Dr. Andy would love you to experience for yourself, the transformative power of chiropractic! To schedule your first visit, call (618) 288-8090 today.